From the New York Times best-selling author of The Legion of the Damned® Novels and The Mutant Files comes the first novel in a postapocalyptic military science fiction series about America rising from the ashes of a global catastrophe. As refugees across America band together and engage in open warfare with the military over scarce resources, a select group of individuals representing the surviving corporate structure makes a power play to rebuild the country in a free-market image as The New Confederacy. 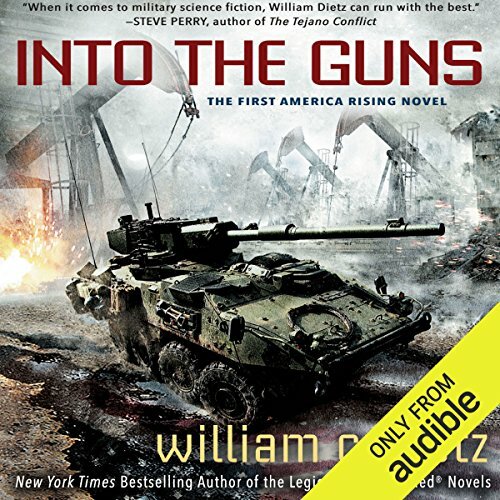 ©2016 William C. Dietz (P)2016 Audible, Inc.
Would you try another book from William C. Dietz and/or Noah Michael Levine? I may pass on future books from this author. While I don't like the progressive angle of this book it is not why I really dislike it. I can read other views, but I need to be entertained by an actually engaging story. This is just a road trip for some of some lost tribe of sorta soldiers and an implausible presidential story line with outrageous stereotypes of what conservatism is. What could William C. Dietz have done to make this a more enjoyable book for you? Readers of dystopian/military fiction tend to understand firearms, military strategy and maneuver and know military equipment so if you are going to write in this genre understand that you may need to employ people knowledgeable in the subject. There are so many errors in the technical aspects in this book like an M1A2 Abrams tank having a 105mm gun, and Apache helicopters that fly everywhere without maintenance, but the Striker vehicles need new engines after 1000 miles. Did I mention that this book is boring and the battle scenes involve days of driving and 5 minutes of battle with little depth of action. Could you see Into the Guns being made into a movie or a TV series? Who should the stars be? Susan Sarandon, Alec Baldwin, Woody Harrelson, and Whoopie Goldberg. I don't know how this book ended, because I have to move on because it just can't get into it after 5 hours of listening. Definitely a progressive slant on a American civil war, but not a bad read. Why do I call it progressive? 1. During a town hall an assassination attempt on Sloan's life was stopped by one of the locals. Then everyone started shooting at the opposite political party. This is how progressives see gun owners . 2. The confederates were seen as money grubbing idiots. A CEO instead of a president. All about profits and not the people. According to progressives this is conservatism. Living in the South I find most confederates care about their neighbors, want smaller government, and want people to be responsible. went in expecting an alternate reality book..
4 chapters in, I realized this was nothing more than political crap meant to frame capitalism as the bad guy and neo-communists as the ultimate good guys. Entirely to much left wing hate against anyone that doest believe like the author does. Sad because the story had potential if only the author painted a legit description of both sides differences . The author could use a military consultant . That aside well written. It might be a great idea if the majority of senior politicians who make the choice for war had experienced being on the sharp end . A GREAT FIST BOOK, THE NARRATIVE IS SUPER EXCITING. THE STORY IS GREATLY ENTERTAINING. A MOST HAVE FOR YOUR COLLECTION. I HIGHLY RECOMMEND THIS NEW SERIES. I found this near future alternative history of a new American civil war to be entertaining. It only requires that you believe that Americans would turn on each other during a time of national crisis. I purchased the next two books in the series after the first few chapters because I’m interested to see how this ends.